A couple of years ago, three friends got together to play music, in order to spend some time together, talk about work related woes, their favourite beers and other stuff. This sounds like fairy tale material, but all too often, those kinds of bands usually stay in the rehearsal room, preferring the hanging out part to the artistic side. In the case of the strangely named band The Gary, things turned out a little more creatively. A first record came out in 2009, and since then they more or less released a new one every year. Their third record was even recorded by Steve Albini. This can’t be said about their fifth and newest record Farewell Foolish Objects, although it was mastered by Bob Weston, so that the Shellac ties are still present. 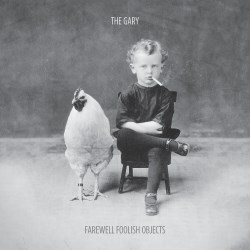 I am not familiar with The Gary’s earlier material, although a quick check-in on their Bandcamp page gives the impression that Farewell Foolish Objects is slightly less rough around the edges than its predecessors, and instead sees the trio balancing a stronger sense of dynamic tension. This can be heard straightaway on the opener Blank, which starts with bassist/vocalist Dave Norwood playing and singing all by himself in a very meditative way, reminding me of the guitarless Morphine, before two thirds into the song the rest of the band kicks in with shattering drums and distorted guitars, ending this track in a rather festive way. The short Coming Up For Air once again showcases a very strong bass line, adding something of a post punk feeling, and another parallel that comes up is Nick Cave, although at times the deliberately low and monotonous vocals also have a certain Lou Reed quality. I even had to think of German indie rock band Ostzonensuppenwürfelmachenkrebs, but I strongly doubt that The Gary from Texas have ever heard of that long broken up band. The nine songs on Farewell Foolish Objects are actually quite short, averaging three minutes apiece, thus making it hard to call this record an actual longplayer. But quantity should not be mistaken for quality, and while the former may be in shortage, the latter convinces thoroughly from beginning to end. The Gary’s music has a dark atmosphere that works perfectly well with their dry approach, using the dynamic range between mellow and cathartic parts to the fullest effect. Fans of timeless indie rock with an undeniable if only occasional noise component will be delighted by the short half hour that the Texan three-piece has concocted. This may not be an instant winner, but investing only a little of your time will show you soon enough the striking qualities of the song material.